Big coupes have been a bit of an American tradition, though one that is rapidly dying. Long gone are the days of the Lincoln Continental Mark IV with its acres of hood and equally enormous trunk bookending a comically tiny greenhouse with just two doors. El Dorados and Thunderbirds have given way to a world where everything, even “luxury coupes”, must be balls-to-the-wall sports cars. But, alongside the 10th generation Ford Thunderbird was this. The 8th revision of the Buick Riviera. One of the last hurrahs of American personal luxury. You can read this review in its full glory at Live Fast Not Loud, a blog about cars by people who like cars. This particular example of Riviera has certainly seen its better days. Brilliant white paint has flaked away revealing bare metal and allowing mild surface rust to creep in.Despite this the Riviera still stands an impressively enormous representation of 90s bubble-tastic embrace-the-low-drag-coefficient styling. Strongly swept front corners leave a nose that sticks out several feet forward of the front wheels for a stupendous overhang while the belt line gently waves backwards before drooping down to a somewhat pinched rear end. It is, in my experience, a somewhat polarizing body style that set the design language for the Buicks of the early 2000s; the LeSabre, the Park Avenue, the Regal, and the Century. It ends up looking sort of like the American version of the Jaguar XK series. One that’s had a bit too much to eat and decided to switch to FWD because it was ‘simpler’. Saying the styling looks like a Jag isn’t necessarily a bad thing, though, and the Riviera manages to wear it rather well. Perhaps one of the most important parts of any car which carries “luxury” in its description is the manner in which the interior is done, and the Riviera does things rather strangely thanks to a lack of what is known as ‘parts-bin engineering’. This term, though you might not be familiar with its definition, is something you might have noticed if you have gotten out of one of the Riviera’s stablemates, say a Park Avenue, and immediately gone and sat in a LeSabre. Whereas both are different-looking cars on the outside and inside there are a number of parts that are shared between the models. Window switches, turn signal stalks, etc. Modern cars take this even further with common steering wheels, gauge clusters, and a majority of the switchgear being shared between models. This is done in order to keep costs down by reducing the amount of distinct parts that need to be made. In the Riviera, however, I can count the amount of parts shared with other GM models on one hand: Radio, HAVC controls, interior door handles, and possibly the foot pedals. Everything else you see, feel, and sit on in the Riviera was design and built for this model by the Lear company. The reason this feels so important is that it’s matters for a flagship vehicle to feel unique. In place of the Buick tri-shield the Riviera has badges that display ‘Riviera’ in fancy script or a simple “R” badge, because the Riviera stands alone. It’s not the Buick Riviera, it is, as the dashboard says, Riviera by Buick. As silly as it seems to make such a big deal out of this and how little this really matters when it comes to the actual interior build quality, this is a rare and somewhat interesting quality for American cars since the days of coachbuilt domestics have faded into the past. As for the interior build quality itself it’s actually quite well done. There are next to no odd squeaks or rattles other than the sound of old poorly-maintained leather, which is impressive considering my usual experiences with Buicks of this era. The squishy overstuffed seats are supremely comfortable, especially the back seat which boasts ash trays, rear air vents, and overhead lights for passengers despite the apparent intention of this car to be a personal luxury vehicle. Legally, this coupe can seat five. It also has a CD/Tape AM/FM head unit with Concert Sound II six-speaker system and an automatic climate control system. There’s a funny little unit below the driver’s ash tray (Americans sure did love their ash trays 20+ years ago) that is actually a CD holder with little indicators to show when a CD is loaded into one for storage. Unlike its platform-mate the Oldsmobile Aurora the Riviera lacks a “unique” powertrain such as the 4.0L Northstar-derivative found in the Olds. For the Riviera Buick went the road of “if it ain’t broke” and tossed in a 3.8 liter “3800 Series II” V6, the same engine present in pretty much every late 90s FWD GM full-sized car. This 1997 has the naturally-aspirated version of the engine twisting 205hp and 220 lb-ft of torque through a 4T65e-HD four-speed transmission. Earlier models used the 4T60e and 4t60e-HD (in the case of Supercharged engines). Starting in ’97 the 65e-HD became standard for both naturally aspirated AND supercharged applications, which delivered 240 hp and 280 lb-ft of input-shaft-destroying torque through the same transmission. The naturally aspirated car is likely to get laughed at for its lethargic nature and “acceleration” merely being a suggestion, but it does what it does and does it without complaint. The engine is neither rev-happy nor particularly torque, and will lazily climb up the tachometer until it hits redline without sounding stressed out about it. At the same time the four-speed automatic will slog through the gears as smoothly as it can manage, though at certain speeds the TCC lockup doesn’t seem able to figure out what it wants to do. Thanks to the high gearing the car is capable of around 25MPG combined, with many instances of it getting 30MPG on the highway. As a “gran touring” car the Riviera is expected to handle. It’s generally expected that a nearly-4000-pound American FWD luxury barge will handle like an office block with pillows for suspension and in that regard it does not disappoint. The incredibly nose-heavy chassis coupled with Macpherson front suspension and a semi-trailing air-assisted rear suspension results in a complacent ride that will carry you over the roughest roads in comfort and float its way down the highway like the finest of clouds. In the corners things fall apart somewhat less than would be expected from such an un-ideal setup, and the car does a surprisingly competent job at disguising its own mass. That being said, it’s by no reasons a corner carver, but minimized body roll and pleasantly responsive steering makes the cornering far more comfortable than the usual vague ship-like rolling disaster that has been every other large Buick I’ve driven. 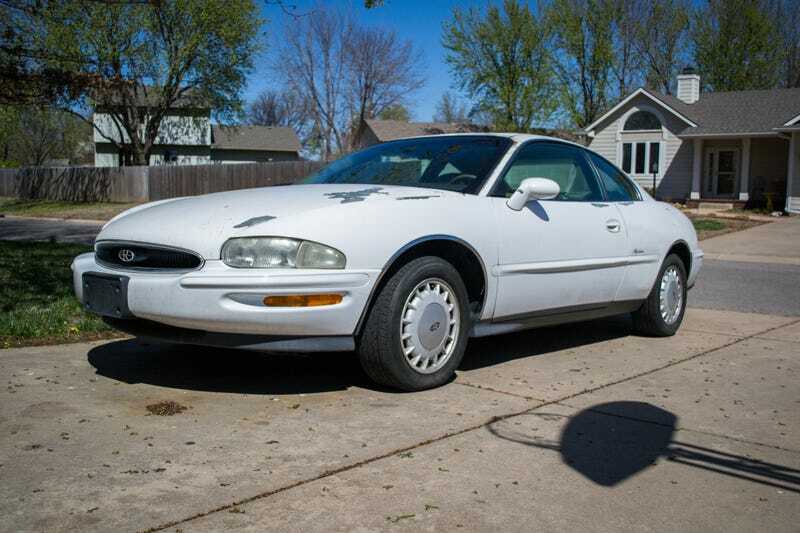 This mediocre white 1997 Buick Riviera is the ideal cheap comfy daily driver. Good fuel economy, the comfort of a La-Z-Boy on wheels, a reliable 3800-based drivetrain, and the styling of a bag of sugar combine to make a car that promises to comfortably schlep you to and from work for a minimal cost. In restored/better condition a Riviera could be a legitimate luxury vehicle which is the reason that the vehicle reviews I have just bought for $650. I will be repairing, modernizing, and customizing the car in “Project Rags to Riches” here on Drive Fast Not Loud over the summer. Updates will be infrequent but fairly large as I take this beater and try to make it something that is genuinely nice. Will I succeed? Probably not. Will it be expensive and mildly amusing? Almost certainly.